The high temperatures over the past week have remained consistently in the high 20’s and low 30’s, which means we’ve been seeing several more mornings of hoar frost (the one on Tuesday 1/19 was especially heavy and beautiful). This morning, however, we awoke to a thick coating of ice. Unlike a hoar frost, an ice storm means that actual precipitation is involved in the form of very cold water or a slushy mix. As this liquid hits the colder surfaces, it becomes solid ice, making walking on sidewalks a treacherous undertaking and scraping your car windows a much more physical activity. The warmer temperatures (and increasing daylengths) have certainly encouraged our local wildlife to become more active. Many of the birds that had been frequenting the feeders behind the Interpretive Center a few weeks ago are now foraging for natural food elsewhere in the arboretum, and the ones that are still around seem to be making less visits. The gray and red squirrels are as active as ever, chasing each other around tree trunks and making bold attempts to raid the bird feeders. The snow has accumulated so much, in fact, that the gray squirrels are now able to jump from the ground to the feeders–rendering the squirrel baffle useless–without much effort. 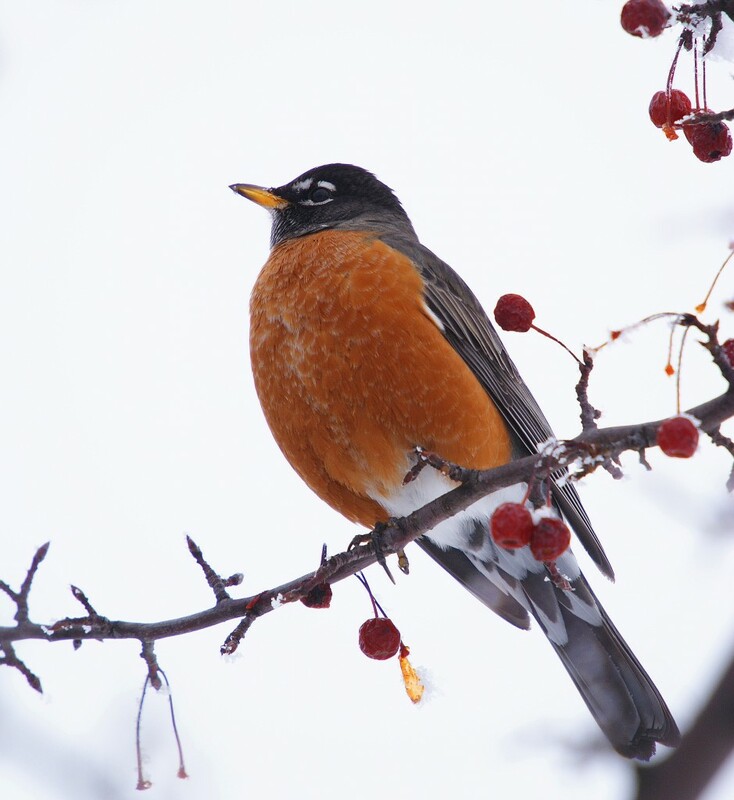 Overwintering American Robin in crabapple tree west of Interpretive Center, 1/19/10.